➢Our mission is to support struggling communities and help them fight their challenges. In a time, where international development funds are being cut, many local NGOs are struggling with the provision of their community services. Tourism is Tanzania's number one economic sector. If there are foreign visitors interested in getting to know their host country in depth, which includes getting to know the Social Reality, and wishing to support those in need, why not use "tourism" as a source to fund social work activities? Without the support from Social Reality Tour, both MANO in Moshi and ZASO in Zanzibar would have had to stop their community outreach programs. ➢Through our experiences in pro-poor tourism and the use of experienced social workers as guides who have been in touch with their communities for many years, we make sure that the visits are carried out in an ethically responsible way. The families visited are genuinly happy that visitors are interested in them, on a personal and not merely financial level. Many friendship relationships between local families and foreign visitors were being created and still continue today, after the visitors have left Tanzania. We assist in post-visit communication between foreigners and local families where needed. It is the decision of the social worker who knows the needs of each family, what is being purchased from the visitors' contributions. 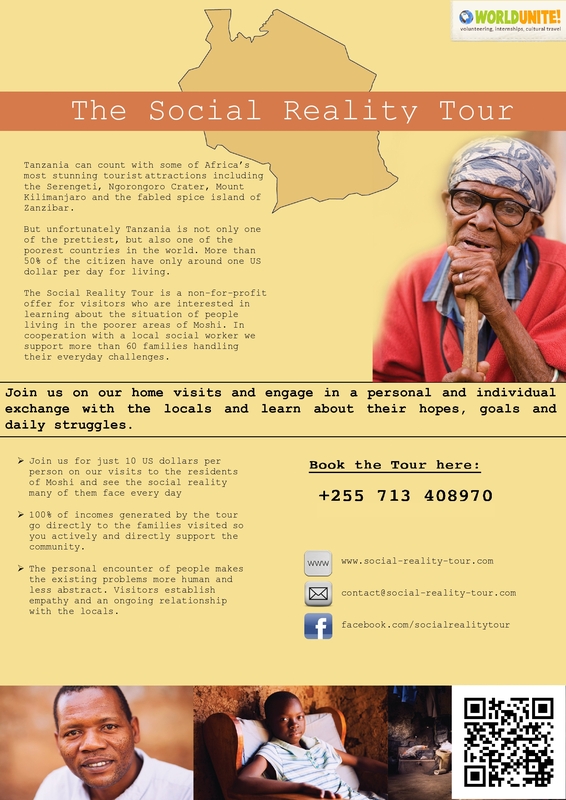 Priority is given to the most urgent needs; the funds raised through Social Reality Tour are utilized as a whole, even families who feel uncomfortable with being visited by foreigners in their private space, can be supported from these funds, if necessary. ➢Our goal is to help the families on a long term. Those who are capable to engage in income-generating activities which will allow them to support themselves, are being encouraged to do so; funds from the Social Reality Tour are being used to educate, train and empower them and to get their micro-businesses started, such as the manufacturing of accessories, pillows, sandals, food items etc.